From a standing start in 1991 with just one model, Odyssey Putters have become a dominant putter designer and manufacturer in the world of golf - both in professional tournament play and commercial success. They incorporated patented soft material inserts since their very first model and they are renowned for their soft feel and excellent roll. Using a similar material to that found in the covers of balata golf balls, they revolutionized the feel of the ball on the putter face, achieving a softer feel than ever before. This softer feel makes Odyssey one of our favourite manufacturers at Best-Putter.com. The Odyssey company was bought by Callaway in 1997, the year that they also achieved the status of number 1 putter in golf in terms of sales and usage among tournament pros. Since then all their putters have been manufactured and distributed by Callaway. But, it is a tribute to the appeal and strength of the Odyssey brand that Callaway has never tried to rebrand the putters as Callaway putters. These are in fact considered quite inferior to the Odyssey brand which has remained a premium brand... with price tags to fit. Odyssey's 2-ball putters have been particularly popular with consumers and successful in tournament play. 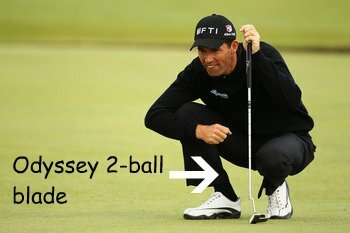 Padraig Harrington won back to back British Open Championships with this style of putter. The patented 2-ball aiming gets the Best-Putter.com thumbs up, along with the votes of thousands of other golfers. 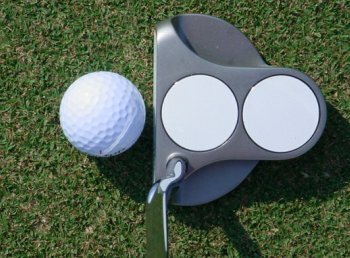 The system really does help you to aim the putter better than a single line, by offering a visual image which the eye can easily see as correctly or incorrectly aligned. Odyssey's insert putters revolutionized the putter market. 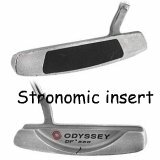 Now virtually every manufacturer produces models with varying insert materials... but Odyssey were the first. And, although we haven't tried absolutely all of the insert materials available on the market, we can say that Odyssey are among the very best. The fact that the company was acquired by Callaway means that a huge number of tour pros on all tours around the world are contracted to use Odyssey putters (although they probably would anyway). The brand has captured many hundreds of tour titles (second in our reckoning at the time of writing only to Ping) and many Majors. Phil Mickelson (below), Ernie Els (below), Annika Sorenstam (below), Bernhard Langer, Stuart Appleby, Nick Dougherty, Padraig Harrington.